The correlation between polymer microstructure of mPEG-PDLLA and secondary aggregation of its micelle was studied. Close examination of 1H NMR spectra revealed that the methine moieties, -CH(CH3)-, of mPEG-PDLLA polymer well represented its microstructure. To elucidate the physicochemical characteristics of various microstructures, we have developed an index, called L-ratio, to indicate the relative content of heterotactic component within the polymer. Storage stability of micelles from six polymers with different L-ratios (L-ratio ranging from 28 to 33%) was studied at 30 °C and 50 °C, and changes in average particle size were monitored to evaluate their secondary aggregation. 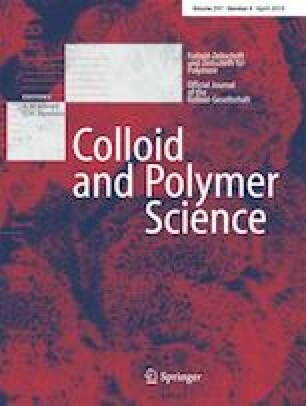 We have found that polymers with high L-ratio takes longer time to secondary aggregation of polymeric micelles to occur. The findings should provide insightful guidance in the development of polymeric micelles. The authors thank Dr. Joonyoung Park for his discussion and proofreading during revision of the manuscript. This study was supported by R&D fund of Samyang Biopharmaceutical Corporation and Grant 10047811 from Ministry of Trade, Industry and Energy (MOTIE, South Korea).